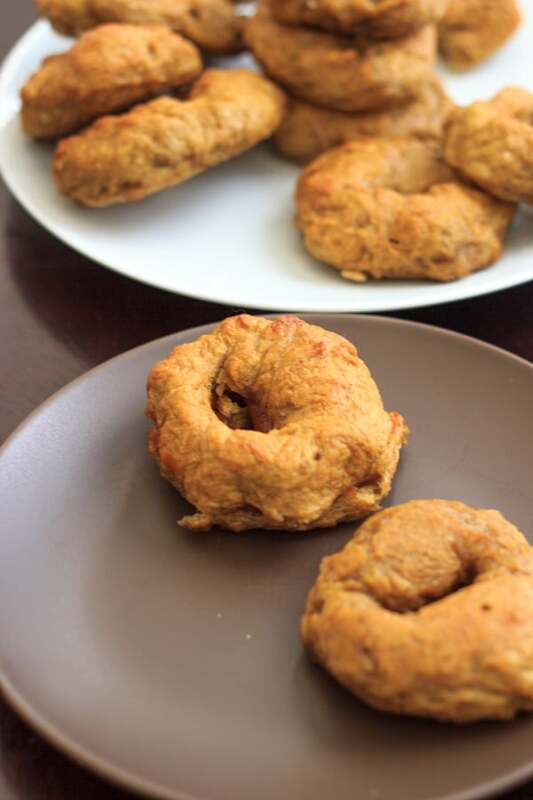 Pumpkin bagels – the perfect carb Fall breakfast. It’s so much easier to make homemade bagels than I realized! I know that may seem obvious, since this is my food blog and all, but I can’t hide my excitement. I knew boiling was involved and typically anything that involved more than one pot or pan scares me off. Before the blog, anyway. Now I have “reason” to push myself out of my comfort zone and make things that I didn’t know I could – like BAGELS. The thing about bagels is, I think I could eat them all day every day. With cream cheese. It’s a problem. That probably wouldn’t be the most healthy thing. But these have pumpkin so… I say we can eat them because it’s Fall. Did you realize this is my first pumpkin post of the season? Since it seems to be pumpkin everything everywhere these days, I was trying not to over-do it and accidentally ended up not doing it at all. Until now. Bagels. The bagels themselves are vegan, which is cool, but if that doesn’t matter to you then you can add an egg wash for a darker color or load it up with said cream cheese. I tried it first with pumpkin butter. Slice it, sandwich it, eat it. The pumpkin butter turned out not to be the most photographic-friendly (i.e. prettiest), but I had to take advantage of all the pumpkin things. What’s your favorite bagel spread? Are you tired of pumpkin this season yet? 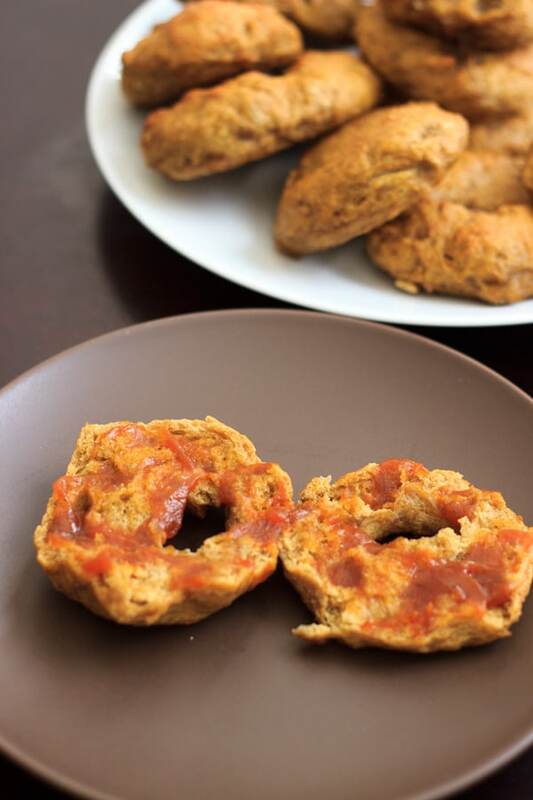 Vegan pumpkin bagels - the perfect carb Fall breakfast. It's so much easier to make homemade bagels than I realized! In a large bowl, add the water, yeast and brown sugar. Let sit about 5 minutes or until bubbly. Add the pumpkin puree, pumpkin pie spice, cinnamon and salt and mix together. Slowly add in bread flour until combined. Knead dough by hand (or with stand mixer) for 5-10 minutes until smooth, adding more flour as needed if sticky. Place dough back in bowl and let rise until double for 1 hour. After rising, separate dough into 12 balls. You can make the bagel shape a couple different ways: Option 1 (this is what I did): poke hole in center of each ball and pull apart gently. 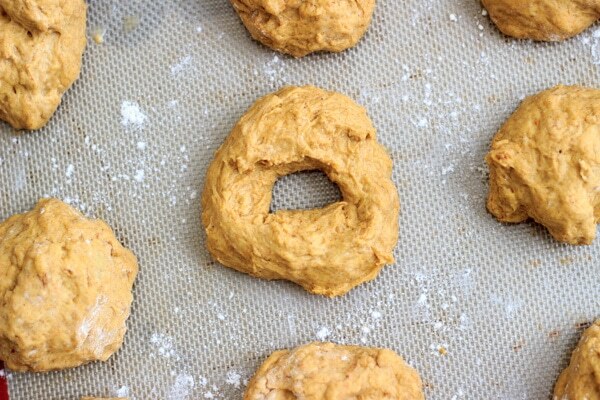 Option 2: roll out dough in shape of a rope, and bring each end together into a circle. Make sure the ends are securely pressed together or else they may came apart in boiling process. Place on baking sheet and let the dough rise a second time for 15-20 minutes. After short second rise, bring a big pot of water to a boil. 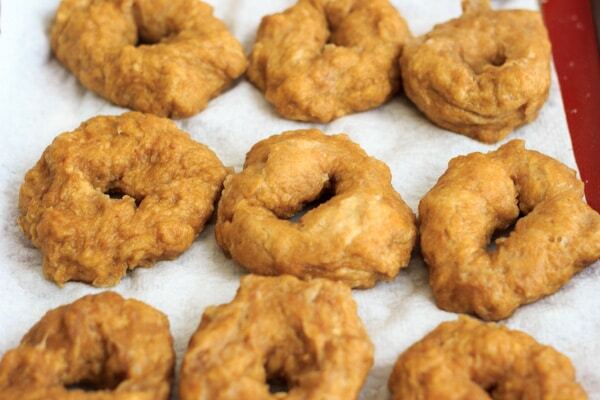 Drop bagels one at a time into boiling water, cooking for about 30-45 seconds on each side. I could fit 3 bagels in at once. Let dry on cooling rack and/or paper towels. Preheat oven to 400°F. Once bagels have dried, bake for 15-20 minutes until golden brown. 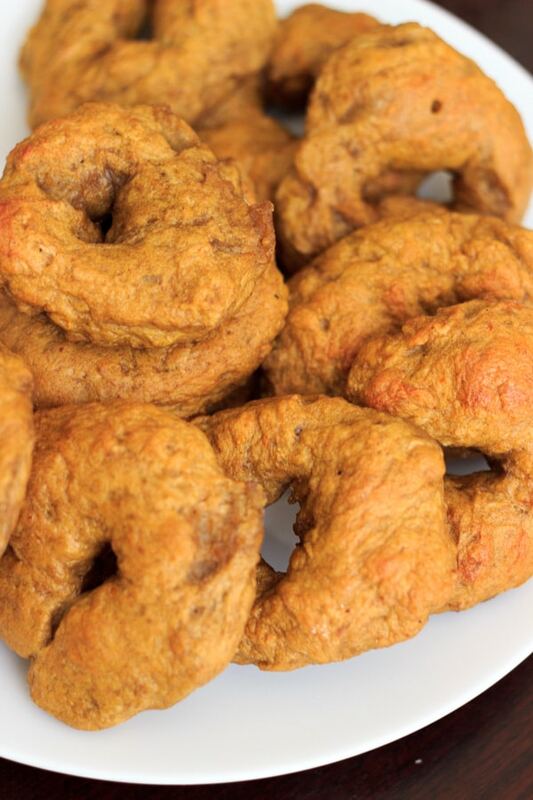 YUM pumpkin bagels sound super de-lish! i gotta try these! I have a daughter who was born on Thanksgiving, and is pumpkin OBSESSED who would LOVE these! I was just thinking about making bagels on my drive in to work. I’ve never made them before so I’m glad to have found this recipe! They have pumpkin in them, so they are a vegetable, and we all need to eat more vegetables! Boiled bagels are the BEST!! I have never attempted to make them, but the process seems pretty similar to pretzels, which I have done, so I really need to try! These ones sound delicious! 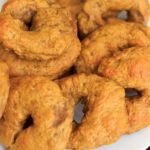 Pumpkin bagels – what a great idea! I bet they are delicious.